Jan 7, 2018-As the quality of air continues to worsen in Kathmandu Valley, people from all walks of life turned out in force for the second successive week on Saturday to mount pressure on the authorities to act immediately for curbing the menace. Hundreds of participants, including students, activists, artists, environmentalists and health experts on Saturday participated in a procession organised under ‘Swachchha Hawa’ campaign around the city, demanding clean air. 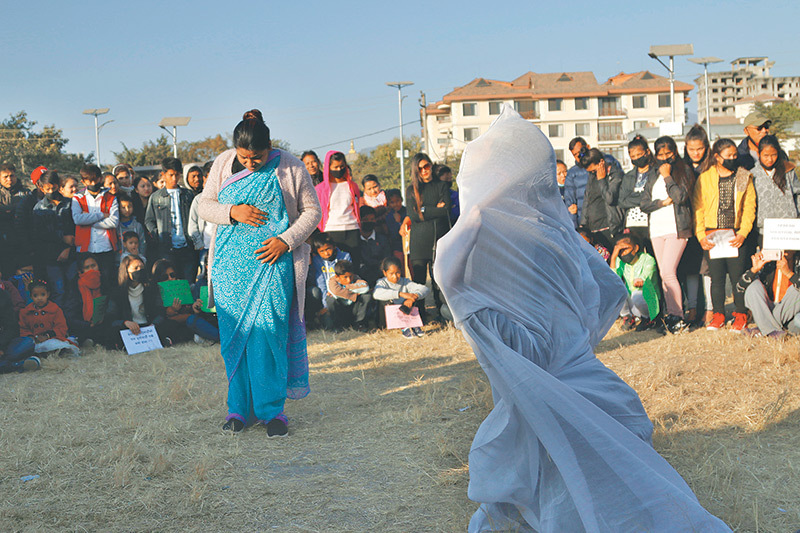 The campaign had kicked off from Koteshwor last week. The procession, which began from the Nepal Academy Hall at Kamaladi, took a tour of the city before turning into a corner meeting at Narayanchaur. Addressing the gathering, campaign coordinator Dipak Raj Sapkota said the procession was organised to draw the government’s attention towards alarming air pollution in the Valley. “We have gathered here voluntarily to mount pressure on the government. While the government does something to deal with air pollution, we should not forget our responsibility towards keeping environment safe and clean,” said Sapkota. Environmentalist Bhushan Tuladhar said that such a campaign from the public was necessary to keep authorities in check. Tuladhar went on to add that the government has conducted several studies on air pollution and designed many action plans in the past, but the problem of air pollution continues to pose health risk due to poor implementation. Air quality in the Valley has been deteriorating, especially in the winter. Many stations installed in the Valley to monitor air quality have been marking higher levels of PM 2.5—one of the primary and most dangerous pollutants in the air. On Friday, one station recorded PM 2.5 level of 155 micrograms per cubic metre. Addressing the gathering at Narayan Chaur, Dr Bhagwan Koirala said air quality in the Valley has been so poor that people from outside can instantly fall sick. “Foreigners and also Nepalis living abroad are reluctant to come to Kathmandu as the city become overly pollution. Anyone can fall sick if exposed to the dusty environment here just for a few days. The metropolis and the government should immediately come forward to resolve the issue of air pollution,” said Koirala.